Two Oak shelves. 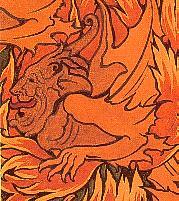 Voysey repeatedly used grotesque face profiles (charicatures of himself and his clients!) on everything from sundials to paperweights, porch brackets, garden ornaments, to wallpaper ( see below ). It was one of Voyseys' great skills to re-work a design for several widely different uses. They always give the impression he enjoyed doing these grotesques. Working in the same manner as Voysey, we adapted his design to produce a double shelf, which offers more storage /display area. This design was also adapted to produce a striking WC toilet roll holder. 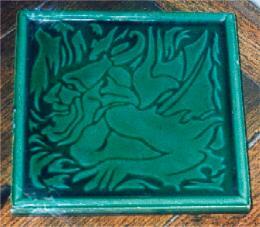 Another couple of examples of Voysey Grotesques / Devil designs, very close in style to the shelves. The wallpaper and tile designs are identical ! With characteristic economy he could re-use one design to produce two striking designs in totally different media. 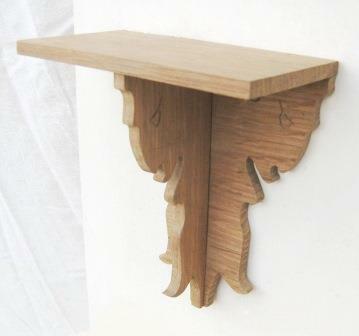 Oak shelf. A very elegant design with a semi-circular top. Judging by the size of this shelf it could have been intended to be fixed to a picture rail in a Voysey room (although a bit high maybe?). Typical Voysey; bone simple & elegant design. ALL SHELVES MADE TO ORDER.